Braced frames and moment resisting frames are used in building and other structures subjected to lateral loads to provide stability or collapse will occur. This is particularly obvious for very tall structures where the lateral forces are the most important design consideration. There are many methods available for stabilizing structures as shown below. This method involves constructing very rigid beam-to-column connections that permit moment transfer across the joint.Monolithically-poured reinforced concrete structures inherently have moment-resisting joints, but steel and timber frames do not. 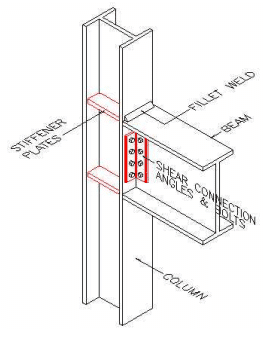 A typical moment-resisting beam-to-column steel-framed connection involves transferring horizontal loads through the beam flanges directly to the column flanges by using angles and column web stiffener plates as shown below. The analysis of the connection is fairly complex. It is very labor-intensive and expensive to construct and is not as good as other methods of stabilization. (a) is X-Braced Frame: Least available space, greatest bending in floor beams. 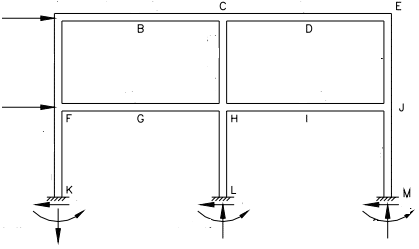 (b) is K-Braced frame: Openings possible, least bending in floor beams.